After the colossal success of Skyfall director Sam Mendes and Daniel Craig return to bring Bond’s origin story to completion. It… is a bumpy ride. If Skyfall was The Dark Knight, Spectre is The Dark Knight Rises. With its previous instalment being such a huge success as well as being incredibly unique in the now twenty-four entries of the franchise, Spectre is completely up against it. 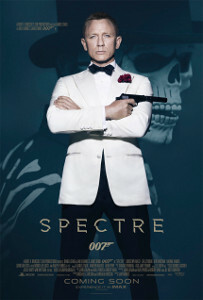 Unfortunately what appears to be a more traditional Bond film from the outset, is exactly that. Spectre (or correctly spelt: S.P.E.C.T.R.E) relies on a lot of mystery and a lot of setup in its task of tying up the underlying plot of the last three films. But avid fans have already called it out; much as with the “twist” of JJ Abrams’ Star Trek Into Darkness, Spectre’s title isn’t the only problem undermining the film’s attempts at mystique. It feels like an conspicuous attempt to remake the series. Action scenes are haphazard and quite baffling. Compared to Skyfall’s train-top earthmover stunt, or the fight in Shanghai, Spectre has you more likely scratching your head asking Bond what exactly he hopes to achieve. A lot of stock is put into Dave Bautista (Guardians of the Galaxy) as Spectre’s silent lead muscleman (who has apparently watched too much Game of Thrones) but apart from an excellent punch up in a train, his scenes feel more like the completion of a checklist than anything relevant. It isn’t all bad though. It earns respect for thematically tying the last decade worth of Bond films together, heck it even references the often reviled Quantum of Solace more than once! The film is in line with a more traditional Bond experience: a globe-trotting plot; a larger than life villain henchman who hounds Bond at every turn; a romantic train journey; isolated super villain hideouts; a comedic edge to proceedings. Indeed, if one thing saves the film it is actually the comedy. Bond and Q have a great chemistry still. Christoph Waltz as the villain of course is good, although he is playing the character he has always played. If Daniel Craig’s Bond films are the first films you are watching, this works as a decent segway into more from the franchise, even if it is a clear sign that the future will be either more derivative or remakes. It has none of its predecessor’s smarts or uniqueness, and while it is perhaps the most fun of Daniel Craig’s films it is laboriously slow at getting to the point. Skyfall was a peak that Bond perhaps will never attain again, and bringing back a reluctant director and lead actor to capture that lightning once again was likely a mistake. While the predecessor was a celebration, this is more of an homage. Lower your expectations and you will enjoy it for its action and its quick wit, its more classic Bond call backs and Daniel Craig still delivers Bond’s more severe personality well. But I found it a slog to get through, with too much setup for a reveal that was completely expected. Additional Marshmallows: What does S.P.E.C.T.R.E stand for? Special Executive for Counter-intelligence, Terrorism, Revenge and Extortion. Now you know!